With the recent opening of the Mark and Debra Leslie Entrepreneurs Lab (eLab), we wanted to interview student entrepreneurs who have been working on developing new products. Abhi Ashutosh (CAS '16) and former NYU student, Tanner Nelson are the minds behind the new app, NYU Events. What are you currently studying at NYU? I’m currently a Junior at CAS majoring in Computer Science with minors in Business Studies and Math. I am also involved heavily on campus, currently serving as the President of TEDxNYU and on the boards of Tech@NYU and HashtagNYU. Tanner is taking a year off from NYU, but was studying Biology and Computer Science in CAS. He was involved in several clubs ranging from Tech@NYU to the Biological Society. You have created an app called NYU Events. Can you tell us how the app works and how the idea came about? As an organizer and attendee of many club events, I wanted a way to let students know what’s going on and also find and explore the expansive community at NYU. NYU Events was born out of the 2014 48-hour Hack NYU Hackathon-winning app “Event Scout”, which aimed to solve that problem. I designed and developed the iOS app and Tanner created the server and Google Glass application. After receiving some enthusiastic feedback from the judges and audience, we decided to take the project further. 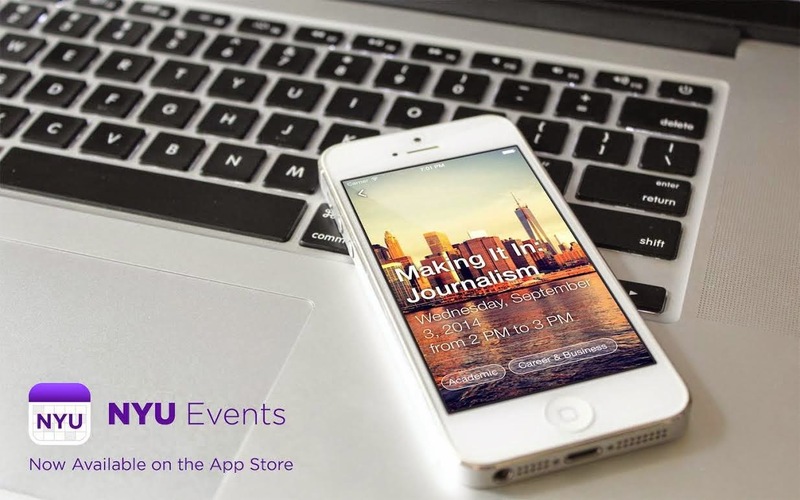 Event Scout was rebranded as “NYU Events” and launched to the NYU Community on September 18, 2014. The app’s main view features a gorgeous photo sourced from HashtagNYU on top of with your calendar (pulled from Gmail, Yahoo, iCloud, etc.) along with events happening around you. You can swipe between days with a new photo at the top for each day. The clubs page shows a list of clubs. Clicking inside will show all the events they have planned. The sections or “tags” page lets students find events from anywhere in the community rather than being siloed into one club or network. The “Food” tag, for example, shows all the events on campus that have food. The “Tech” tag shows all the events, from any club on campus, that have to do with technology. By removing the barriers between clubs, students can now easily find what they’re interested in and explore the community further. On the server, we’re sourcing events from Facebook, EventBrite, and Meetup and automatically parsing them into these categories. Clubs simply sign up / verify themselves on our website and we do the rest! What makes this app different from other crowdsourcing event apps? NYU Events is focused on the NYU community as a whole, breaking down the barriers between clubs to let students freely explore all that the community has to offer. Most crowdsourcing apps either show a simple list of events happening around you or mash everything together. Our value prop is that we carefully section off and tag events so you find a community that fits your interest, but are not siloed into a single club or organization. Many NYU clubs and offices want to increase student attendance at events. Do you see this app helping boost attendance at events? As club leaders, one of our biggest worries is whether or not our event will retain the turnout you are expecting. To test NYU Events, we ran a 2-week beta before launching to make sure it would actually help organizers out. We found that NYU Events increased turnout to events by 10 – 20% depending on the size and type of event. We’re absolutely confident that NYU Events is a win-win for both organizers and attendees! Will other departments at NYU be able to add events that are open to students? A club or organization simply has to add or verify themselves on our website (nyu.has.events) and events will start appearing on the app within a few minutes. Events are pulled from Facebook, Eventbrite, and Meetup, but we definitely want to allow clubs to add events to the app directly at some point. Do you plan on working on any other apps in the future? Absolutely! I’ve built a couple of apps before NYU Events. “Caleido” (formerly Event Book) was my first iOS app. Caleido has been featured by Apple and TechCrunch, has reached the #1 spot on the App Store in over 15 countries, and currently has a little over 400,000 downloads. I’m currently also working on my own startup called Kipin Hall, which has launched at NYU, Harvard, Columbia, Baruch, Rutgers, and iTunes U. We were recently named semi-finalists in the ongoing $5MM Robinhood and $1M Verizon Powerful Answers competitions and have an exciting couple of months ahead! Tanner has worked on several iOS projects before too, most notably “Ego”, a tongue-in-cheek dating app that matches people based on looks. He has another app+site launching soon called Swipe Me that aims to connect people with too many meal swipes to people who need them. He is also working as the chief iOS engineer at a mobile marketing firm during his gap year. The Mark and Debra Leslie Entrepreneurs Lab recently opened up on campus where aspiring NYU entrepreneurs can meet to discuss and develop ideas. From a development perspective, can you talk about the importance of having such a space on campus for students? The eLab, which is located in the heart of NYU’s main campus, is a great space for developers and entrepreneurs to work together, hangout, and create. The eLab features a slew of cool, modern, entrepreneurship-centric areas including the “Pitch Elevator”, “Option Pool”, writable walls, and garage-door separated meeting rooms (so you can “create a startup from your garage”). Having attended several events in the space, I can easily say one of the best aspects of the eLab is the virally exciting energy it gives off. While we have large tech (Tech@NYU, etc.) and business (CASEA, EEG, etc.) communities, the two don’t often collide. As both a developer and entrepreneur, I know just how important it is that these two often-disparate groups find common ground to work together. I believe that the eLab can serve as that place. Tanner agrees with the above thoughts and feels meeting people and finding new perspectives is critical to tech. The truly great things are created when people put their minds together.